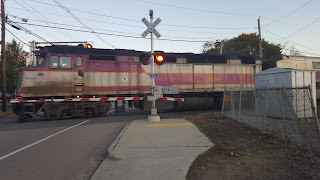 Franklin Matters: "not everyone wants the sound of silence"
Fox25 has an article and video segment on the train signals in Franklin. "The arrival of the commuter rail train in Franklin is signaled by a loud whistle, but that’s causing a commotion and some are pushing to silence it. “Many, many blasts on the horn late at night, it wakes people up very late in the evening or first thing in the morning,” town council candidate Eamon McCarthy Earls explained. Representative Jeffrey Roy is one lawmaker pushing for a quiet zone in Franklin. He told Boston 25 News as loud as they are, train whistles are not the solution when it comes to safety."